Mix Ratio: 1 to 1 (equal amounts of the A & B side by weight or volume). 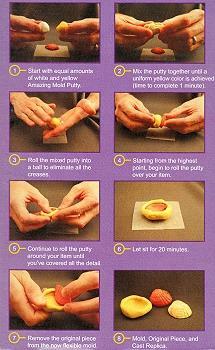 Open Time: 3 Minutes - amount of time allowed to mix and form the putty over your item before the material begins to harden. Warm temperatures decrease open time. Demould Time: 20-25 minutes - Based on mass and temperature (the time at which you are able to remove the mold putty from your original item). Note: The thinner the mould, the more flexible it will be to help you remove parts with undercuts. 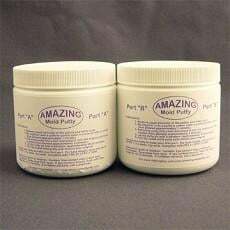 1) The Amazing Mold Putty can be used for multiple castings from the same mould. 2) If using the mould for food products for consumption, do not use the mould for any other purpose to prevent contamination and make sure to wash the mould with soap and water before using it for food applications. 3) Mould life depends on the complexity of the part you are moulding, what material you are pouring, the thickness of the wall you make in your mould, and how delicately you handle your mould. 4) Your mould made with Amazing Mold Putty will withstand an operating temperature of 395 degrees F.